Are you looking for a professional tool for your digital designing needs that helps making your marketing strategies better? Then, Crello is perfect for you. There are many visual graphic design tools out there in the market. Some of them are quite expensive. Other free tools need a forced sign up to use few of their features. Hiring real graphic designers can be too costly for startups and small businesses. Crello provides solutions for all of the above issues. It can be used as an alternative for other good free design apps like ‘Canva’, an easy and simple to use tool for creating outstanding designs yourself. Crello is a cloud based application with free and pay-as -you-go options for visual graphic solutions. It can be used by novice as well as pro designers. Designs can be created using a good number of templates to choose from, borders, texts, animated designs, text frames, text badges, photos, icons and many more exciting features. It has around 60 million components that can be chosen in free and paid subscriptions. How to start using Crello? 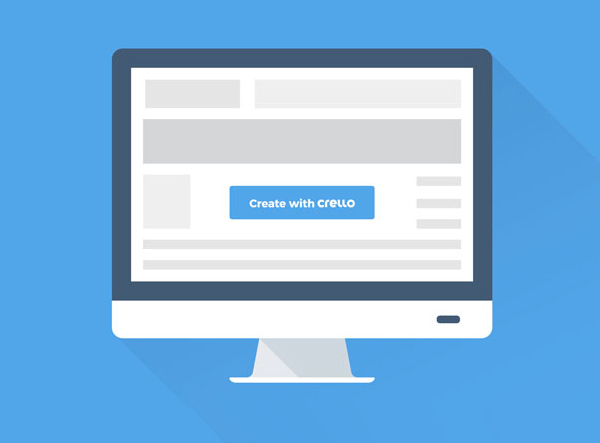 Using Crello as a design tool is very simple and easy. You can start simple designing with features like animated designs or templates even without signing into the tool. If you want to use all the features as free and professional user, you can sign up. The signing up is even easier. You can put your email and create a password, or you can simply login using your social media accounts like Google+ or Facebook. After the signing up option, you can view your dashboard. It offers many templates, designs and tools to choose from for designing work. You can navigate to My Projects, Inspirations (already created designs), Account Settings and Help and Support after signing in into your own account. How to create a design with Crello? You need to choose which project you want to create a design for. For example – Instagram Stories, Social Media, Blogging, Marketing, Event Management or Advertising. Let’s say you want to create a post for sharing your views on Instagram Stories. So, you need to select the tab Social Media Posts. Once you select this, you can see a lot of templates and designs are there to select from and on the left side of the design board, you can see the tools like designs, Photos, Background, Texts, Objects and My Files. When you start creating a new design, it has name “Untitled Design” by default. You can change the name of the design as you like. On the right hand side of the board, you can see three options for Save, Share and Download the design you have created. You can choose already built templates to design your graphics, or you can start from the scratch to create a new design with using images, icons, texts, animations and other components. You also can create your design for a specific industry like Beauty, Fitness, Magazine, Technology Science and many more, which is quite an impressive feature. On the templates, texts can be edited, images can be changed and anything you like can be added. Settings of the images can be edited with options like Brightness, Contrast, Opacity, Blurred etc. There are objects like shapes or a pen tool to draw shapes for a more personalized option. 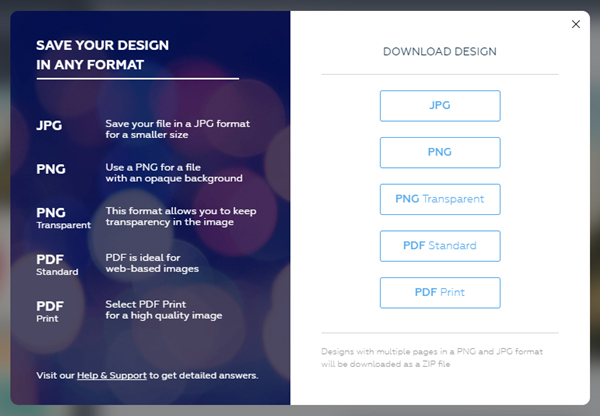 Designs can be saved in different formats like JPG, PNG, PNG Transparent, PDF standard, and PDF Print. 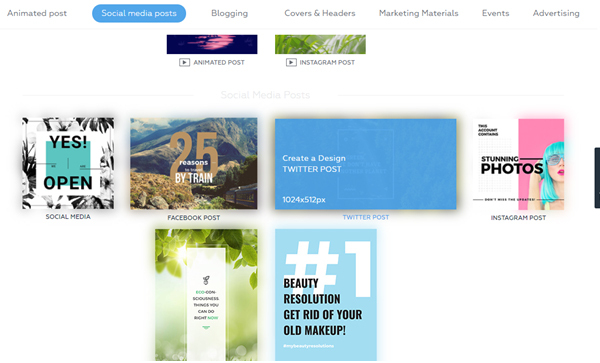 You can share a design on social media or anywhere using an embedded link. Crello is a simple and easy to start with tool with 6000+ free templates, more than 60 million free and paid stock photos and 10000+ designs. It gives option to personalize anything with design components. You can create Facebook or Instagram stories, Facebook Ads, Youtube Channel Art work, Twitter Post designs, Instagram Ads, cover photos for other social media by downloading designs in 29+ preset formats with preset sizes crafted to fit everything you need. Filters and visual effects to modify the texts and images. Once buy a premium element can be used multiple times and remains in your account. 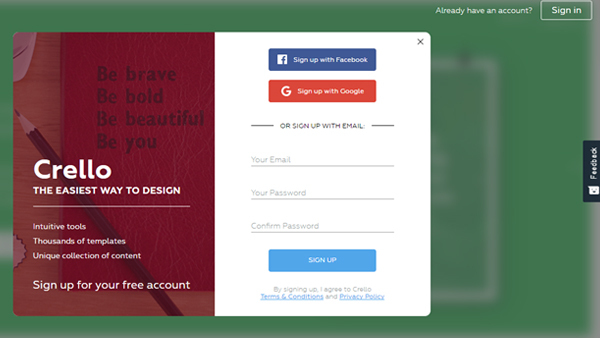 Crello provides unlimited storage to save your designs in your account. You even can create and organize folders to save image and organize them as per your requirement. If you do not like the images it offers, you can create your own image and font and can upload it to Crello to create your own personal design. It offers a pay as you go option. You can choose from free options or you may purchase premium components but there are no hidden charges. Crello offers a flexible platform to drag and drop components wherever you want to create an amazing design. Animated designs – If you hire a professional designer to create a design that moves, it can make a hole in your pocket. Crello has added this outstanding feature of animated designs to create a moving Ad post for that Social Media Ad of yours. Frames – Crello is offering designer frames to achieve a more professional looking graphics you wish for. Text Frames – These are another exciting features like designer text frames that are filled with images or patterns. Multiple Page Designs – You can create a design with multiple pages with Crello as an advanced feature. Crello is a tool for everyone from beginners to professional designers, from startup and small firms to big enterprises, which helps to create extraordinary graphic designs for all the digital marketing, blogging and social media needs of new tech savvy generation.